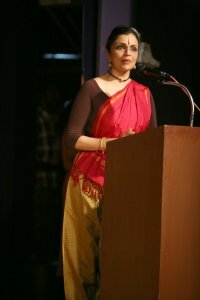 Presentation thoughts about music to an audience so well versed in the many nuances of Bharatanatyam is a challenge. 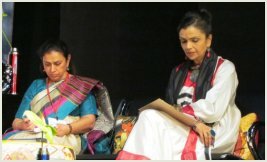 A dance conference that includes sounds and movement vocabularies from around India presents a plethora of musical riches to Chennai audiences and I often wonder what I, as a dancer chosen to speak from the Bharatanatyam genre can offer or share that could be an alternative vision to both dancers and dance makers. 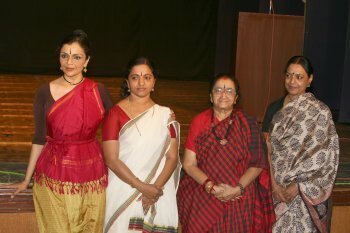 Alongside Kathak, it is Bharatanatyam that has been the most adventurous with its form and content. So many experiments with the mixing musical genres and movement experimentation have occurred during the past 25 years that it seems that almost every permutation and combination has already been tried. Rhythms, melodies, ragas, western and eastern instruments in consonance, new lyrics and pulses - new themes... you name it and Bharatanatyam has seen and done it. And so I would like to begin with what I feel should be the patina of sound for a performance. Or should I say, BEFORE a performance. Even before the orchestra has struck their first note and the sounds of the violin, veena, flute and the singer begin in "raga nattai" and the words in homage to Ganesa, we have already entered as the audience into auditorium and are waiting in anticipation. The music choice for the "house" as the space is called around should already be vibrating with the choice of music that is compatible with what the dancer/choreographer wishes to express through her performance which is to follow. This pre-show music is normally followed by the prologue music which is not the same. Both choices are equally important as the melodic structure of the actual body of the dance performance. For NEELAM, my presentation on Sri Vishnu, I had the simple sounds of OM NAMO NARAYANA sung very softly for 30 minutes as the hall doors were opened to the crowds. Before the performance actually started a traditional mallari on the nadaswaram played for 3 minutes to a closed curtain before the first item began. This helped set the mood for the audience and set the stage for the meditative and ritual framework of NEELAM. For 7 GRACES, inspired by the Buddhist Goddess Tara, the sounds of the Tibetan flute were played very softly as to create the mood and not to disturb the flow of the audience, and yet very gently lead the audience in the mood of what they were about to see. In the noisy and often hurried atmosphere of the season performances, there is no time to be contemplative and so it is even more imperative to think about setting the mood before the dance performance actually begins. For FACES, a new hour long showcase of several dances, I have selected the music of Anil Srinivasan along with the violin of Amrita Murali. Together they have played the raga Madhuvanti alongside which I have included some phrases and poetic prose about the idea and concept of FACES. This proloque is NOT a verbal introduction of what exactly the audience will see but instead a suggestion of the landscape of the work that will be revealed to them in sections. So, Sangeetam in dance begins even before the performance starts. Also, our definition of what constitutes music for dance has changed over the years. More than melodies and jathis in various moods, paces and combinations, newer sounds have been introduced with the gradual acceptance of recorded music scores for dance performances. I have moved towards using commissioned and recorded scores for all my productions for the past 6 years, not using the regular dance orchestra and thereby allowing myself to include more musical inputs than ever before possible. In 1996, with the grant from the Department of CUlture, Government of India, I began research on the sacred chants in several Vaishnav temples. Each temple, near and around my ancestral village of Tirukurungudi in the Tirunelveli district of Tamilnadu, had a unique way of chanting the Divya Prabandham, the sacred 4000 verses so central to the worship of Vishnu in Tamilnadu. The atonal chants were unusual and jarring to the ear trained to listen to the mellifluous notes of Carnatic ragas. Yet they also carried a pulse and a flow that was unique to the long meditative corridors of the temples they were chanted in. The study allowed me to enter into the spaces and interstices of the words and the silences that punctuated the hymns. Alongside my study of the Arayer Sevai hand gestures from Sudharani Raghupahty and later from the Arayer priests themselves in the temples of Sri Villiputtur and Alwar Tirunagari, came the discovery of the consonance that these chants and gestures contained within themselves - separate but not different from the intention of classical Bharatanatyam. Using the actual temple chants by a male priest layered with the female voice repeating the famous verses uttered by the 9th century Tamil poet Andal made for both an interesting slice of theatre and an aural depiction more powerful than putting these same words to a melody. Adding to that was my own voice, making the sound scape human and immediate. Moving further and further away from the regular dance repertoire, I realized that in order to flesh out my ideas I needed to collaborate with musicians and composers to whom the world of sound was not relegated to music alone. Here are a few examples of the experiments with sound and music that I was involved in. In DAUGHTERS OF THE OCEAN, the music was merely the backdrop whereas the choreography, on four dancers, worked sometimes with and often against the raga alapanas. As the sutradhar, I often bracketed the score with songs or chants. 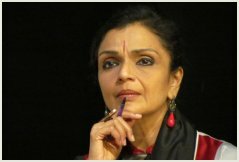 For VAITHARANI, the dance about the journey of the soul struggling to cross over the river of death. Mridangist and composer KSR Aniruddha gave me a continuous jathi like the flowing river itself... never returning to the beginning and always flowing forward. Sound engineer Debashish Sinha made the famous chant of the Maha Mrityunjaya Mantra in a continuous loop with the underlying harmonics that gave familiar auspicious mantra a surreal sound. For UTPALA, the production about the Lotus, various water sounds were used, from small rivulets to gushing rivers, stones dropping into ponds and the ocean waves. We traveled to gather these various water sounds, not limiting ourselves to music and sound samplers. Contrasting these nature sounds were the choric refrain of the tavil and ghatam - thus creating a soundscape of the soft and strong, like the enigma of the lotus itself. For 7 GRACES, a solo on Goddess Tara, authentic Tibetan chants were the base of the sound design with a recurring motif of the Sindhubhairavi raga and various other elements like tribal Thudumbu drums, Tibetan flute and western operatic arias making up this eclectic score. For NEELAM, the sounds were traditional, not classical. 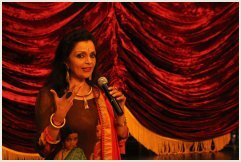 In that I mean that the music had definite Carnatic references, but they were composed and imagined by concert singers and musicians who accompany dance. What challenges does this combination provide to the dancer as choreographer? An example from NEELAM is the structure of the Ragam, Tanam and Pallavi of Dikshitar's famous tune RANGA PURA VIHARA. Taking from the famous temple itself with its seven prakaras - there were seven layers to the melody - four different sangatis to the pallavi, and three different sangatis for the final charanam. The main idol of Ranganatha like the temple gopuram itself, rising serene supernal, shorn of any clutter (and therefore shorn of any orchestration or instrumentation but the melody itself). The composition itself is the highlight, and the dance arises from and is contained by it. Composed by Anil Srinivasan, who has been my collaborator for the past 3 productions, the idea was to use Carnatic music as they are sung and not specifically tailor made to suit either a set choreography or with stage directions. This frees the musical execution from shackles of "made to order" music. Lyric, meaning and harmony flow more freely, thus making them suitable to a larger template of colours. The entire composition was imagined in the traditional ragam-tanam-pallavi structure. The composer shared his thoughts with me and we discussed the space for some rhythm structures to be included or inserted into the flow of the music. The ragam was to allow many shades of abhinaya to be explored - the tanam would act as the sollukattu to the more elaborate delineation. The idea of poetry in motion - or sound as motion - when we sing and play; we think of each idea and thought expressed by the lyric as dancing - at least both visually and spatially. This is executed in the music AND in the dance. As a dancer, these are simultaneous deliveries - not a chicken and egg situation. For FACES, the composer Anil Srinivasan has used the talents of concert singers but also created a new short score with the embellishments of Japanese KODO drums, the traditional Devi chant of "AYIGIRI NANDINI" and the layered sound of Muthuswami Dikshitar's "Kanaka Shaila Viharini". Layering the evening from prologue to the conclusion is his evocative piano. Using a non Indian percussion / melodic instrument like the piano for Bharatanatyam could be considered dabbling with modernity. However, it is the harmony that I seek. The sensitive treatment of melody with different layers of sound which equals different moods and expressions allows me as the creator/dancer to respond through body movement. What if we had no music but the pulse of our own voices in silence and the gentle sounds of water? What if the words themselves are the music and the dancer did NOT respond to each word with a gesture or abhinaya? I have attempted this in one section of FACES in which a poem relating the many phases of the waxing moon is compared to the features on Devi's face. This section, coming after some very vigorous and expressive dancing, is the 'face' in the dance space. The poem is read more than once to allow the words to dance/paint the images into our minds. In the silence that comes after, the dance begins and continues. Since I have entered into collaborative works with artistes from various disciplines, I have had to address the musical structure of each of these venture/adventures. The idea of the 'sacred' in music and dance has been a constant preoccupation - besides the continuing metaphors of Goddess, woman and water. What makes a song special and the voice of some singers take us closer to the sacred source? Not only in our music and traditions are found deep sources of the divine. There are moments around the world where both architecture and sound take us closer to that infinite source. I would like to now share the voice of the legendary opera singer Maria Callas. Her classical renderings in the western operatic style made her a goddess in her country, Italy and around the world. In this section, her gentle voice is the final path that I take as the journey towards the sacred horizon in completed. This is the final section of 7 GRACES, in which the dancer as devotee is traveling with confidence and later exuberance towards the 'mother' who created her. The voice echoes, follows, supports but also releases the dancer beyond the expected framework. I stand here today representing the style of Bharatanatyam and have shared the journey that one dancer, trained rigorously in this style, can make. The best known vocabulary my body knows is Bharatanatyam but as with my music choices, my dance itself echoes this classical source while continuously exploring other forms. To continue my artistic journey while retaining the same style of compositions that I performed to as a teenager would not serve either the dance or the music. It is Bharatanatyam that has allowed me to dream and to fly. This great style is the bedrock of my body's response to the universe. Dance ultimately lies in the rasanubhuti of silence. This is what so many of my productions over the past 10 years have explored. This silence allows the mind to ponder, and form a coherent thought before being rushed into the next face/movement. These silences punctuate the music without puncturing it. Using the voice and the face of each source, voice, percussion, nature, life - music for dance can be as rich and varied as life itself.